Welcome to the May 2015 Newsletter! First of all, we would like to apologize for the different problems encoutered with our VPS. Everything seems to be now fixed up (Thanks Tristan!). 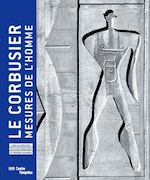 Among all the books published at the occasion of the 50th anniversary of Le Corbusier's death, we decide to feature Le Corbusier : Mesures de l'homme, the catalogue of the retrospective exhibition devoted by the Pompidou Center. Two books, Kill City and Le Crowbar dedicated to a certain youth for which freedom means squatts and traveling. Djerbahood is the book relating this extraordinary experience of transforming a Tunisian village into a piece of (street-)art. Les Catacombes - Histoire du Paris souterrain by French specialist Gilles Thomas is a brand new book on a hackneyed subject. But, its way to relate the underground Paris with many literary quotes and other references saves the book and gives it the chance to be put on your bookshelves. Coalstrip, Montana will be our back list item. This book of photographs by David T. Hanson is an important testimony of the ruined landscape caused by the coal industry. Photographs by David T. Hanson of the coal-mining town of Colstrip, Montana. Photographs of the open air museum of street art in Erriadh, Tunisia. Catalogue of the MoMA's exhibition. Ctalogue of the exhibition at the Pompidou Centre. Photographs by Tom Hunter of a nomadic party community. Litterary walk of the underground Paris by French specialist Gilles Thomas. Copyright © urban-resources.net - May 2015 - All rights reserved.